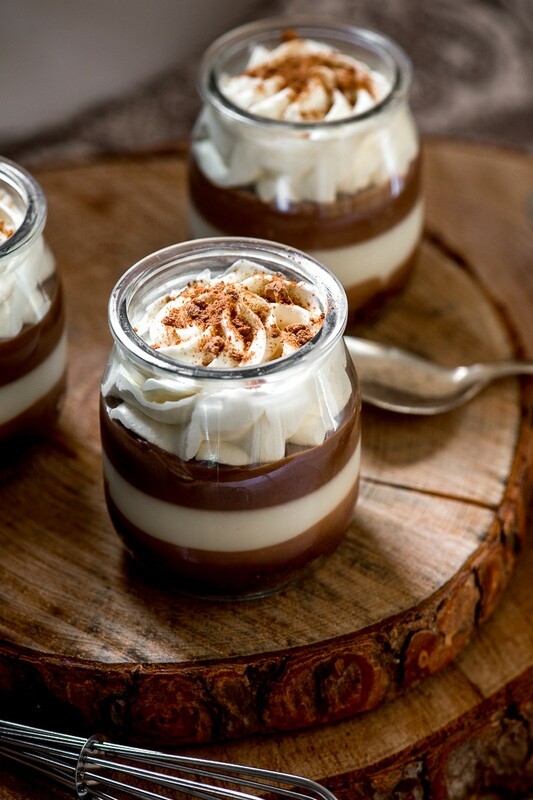 There is something about layered desserts that looks so striking. Having several layers in one dessert means a different combination of flavours and textures in every bite! 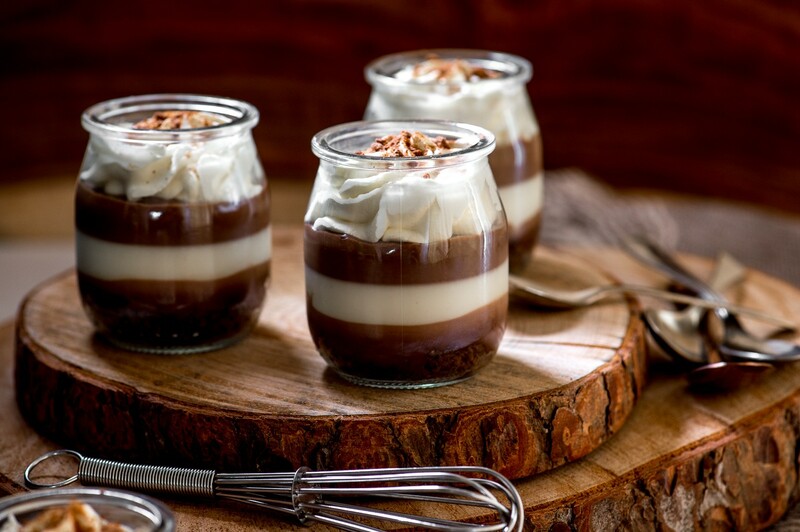 These Mini Milo Trifles consist of layers of crunchy biscuit, chocolate ganache, soft condensed milk jelly, malty Milo custard and a swirl of whipped cream to finish. Although each layer is easy to make, this dessert does require some planning as the layers need to cool and set in time before adding the next layer. 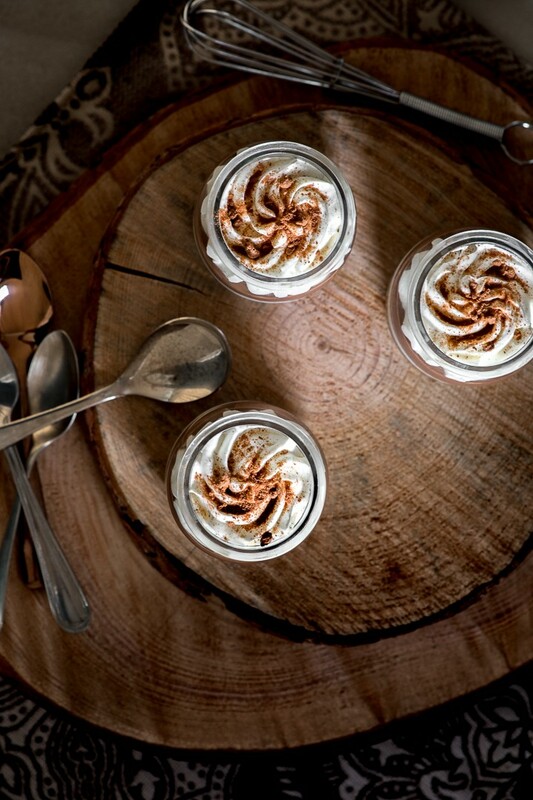 Your patience will however be rewarded when you see the resulting mini trifles, just begging to be tasted! P.S. Milo fans – try this decadent cake! Start by making the condensed milk jelly. Sprinkle the gelatine over the water and leave to sponge for a few minutes. Heat the cream and milk together in a small saucepan until just starting to boil. Remove from the heat and add the sponged gelatine and condensed milk. Stir until smooth. Cover the surface of the mixture with clingfilm and leave to cool to room temperature, then refrigerate for 1 hour. Do not allow the mixture to set! Crush the biscuits into fine crumbs in a food processor or with a rolling pin. Stir in the Milo and melted butter. Divide the crumble mixture between 12 glasses or glass jars (about 150ml-200ml in volume) and press down with a spoon. Refrigerate until set. Next make the ganache. Place the cream and chocolate in a heatproof bowl and heat over a pan of simmering water. Stir until smooth and uniform. Alternatively use a microwave and heat at 30 seconds intervals, stirring inbetween. Spoon or pipe an equal amount of chocolate ganache over the crumble layers and refrigerate again. Check the condensed milk jelly -it should be cold so as not to melt the ganache layer, but not yet set. Divide the condensed milk jelly mixture between the 12 jars, pouring it gently over the ganache layer. Refrigerate until set, about 1-2 hours. Next make the Milo pudding. Combine the sugar, cocoa, Milo, salt and hot water in a saucepan. Stir to dissolve, then bring to a boil over medium heat. Reduce the heat to low, then stir in the chocolate, cream, and milk. Stir until the chocolate has melted, then add the cornstarch mixture. Bring back to a gentle boil over low heat. Cook for 3 – 5 minutes, stirring constantly until the mixture has thickened to a custard consistency. Strain the custard into a heatproof jug and cover the surface with clingfilm. Leave to cool to room temperature, then refrigerate for about 1 hour. Pour or pipe a layer of cooled Milo custard over the condensed milk jelly. Refrigerate until set. Whip the cream and condensed milk together until you have stiff peaks. Stir in a dash of liqueur if desired. Pipe a swirl of cream on top of each trifle and refrigerate until ready to serve. Just before serving sprinkle a little Milo over each trifle.